Joseph Christian Leyendecker and his brother Frank X. Leyendecker, both among the absolute best illustrators ever, acquired some of their marvelous technique, finesse and painting skill in the course of classical art training in Europe. It was common in the late 19th Century for American artists to make the pilgrimage to Paris, the bright jewel of culture around which the art world revolved, and study at the schools there where the traditions of western art were being handed down in an unbroken chain from the time of the Renaissance. J.C. and Frank Leyendecker studied at the highly regarded Académie Julian at a time when William-Adophpe Bouguereau was its director. Bouguereau, whatever else you may want to say of him, was a superb painter and a master of the techniques of classical painting. The Leyendecker brothers, as well as many other American artists, put their European training to good use, but also took their own direction, creating a unique fusion of academic skill and lively American inventiveness. There is a terrific opportunity for those within reach of New York to see an exhibition at the Society of Illustrators titled Americans Abroad: J.C. Leyendecker and the European Academic Influence on American Illustration that focuses on that influence; and features a number of works by J.C. Leyendecker, Frank X. Leyendecker and other great illustrators who shared in that tradition like Edwin Austin Abbey, Howland Blashfield, W.T. Smedley and Everett Shinn. The Society’s web site is kind of awkwardly arranged, but the show is mentioned on the home page and there is a more detailed PDF press release. The exhibition runs to July 12, 2008. 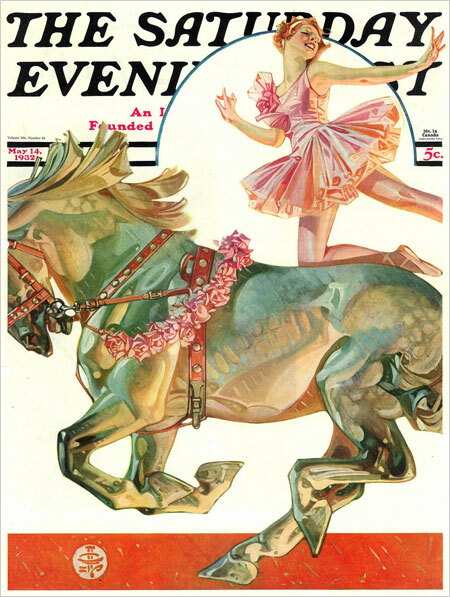 The image above, the original of which is part of the show judging from the Society’s web site, is from Andrew Bosely’s blog A Little Bit of Leyendecker Greatness; which is a treasure trove of high-resolutinon scans of Leyendecker Saturday Evening Post Covers. See the links below to my previous posts about J.C. Leyendecker for links to other Leyendecker resources around the net. i wish i was there to attend, Leyendecker is probably my favorite illustrator ever. JCL was way ahead of his time. I just sort-of moaned when I saw this illustration. Been interested in fairground art myself, having seen quite a bit of it, the shadows and colours on this horse made me moan out loud. So wonderful.